CDCA-administered examinations are reported through a secure website to all states or jurisdictions that accept the ADEX examination**. If you took your examination for licensure in only one state or jurisdiction, your scores will only be reported to that state or jurisdiction. Do not submit a request for an Official Score Report until you have received the scores for the examinations that you wish to have reported. There is a $30.00 processing fee per address (up to 4 copies per address). All payments must be made using a VISA or MasterCard. All score reports are sent via USPS without tracking. The office processing time is 5 business days or less from the date the request is received. Once you have successfully requested your score report, you will receive a receipt via email. Additionally, you will be notified once your score report has been mailed. The CDCA will process a full refund to your original payment form if the request for the refund is submitted before your printed score report is generated or if it is determined that you did not take a NERB or CDCA examination. If your licensure governing authority or another agency requires an official paper copy mailed to them, you may make your requests by clicking on the appropriate button below. **Nevada currently requires candidates applying for licensure to request a paper copy of their scores to be sent to the Nevada Board of Dental Examiners. 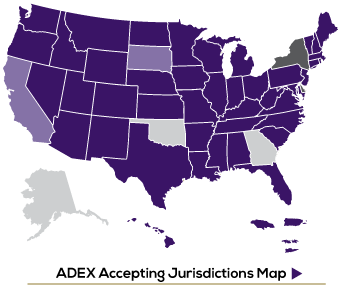 For all other jurisdictions that accept the ADEX examination it is not necessary to request a paper copy of your scores.